South Africa: Free Spring 2012 digimag edition of "Wild" is out now! The Spring 2012 (#20) digimag edition of "Wild", Wild Card's free wildlife environment and travel magazine is out now. The current edition contains stories about the new Pafuri Camp in Kruger National Park, about the Hluhluwe-Imfolozi Park in KwaZulu Natal, about the Bontebok National Park in the Western Cape, as well as about camping, 4x4 trails, birding and the secrets behind South Africa's lush grasslands and much more. Enjoy! The Automobile Association of South Africa (AA) has announced the national winners of the 2012 AA Quality Assured Accommodation Awards programme, in which only AA Quality Assured members are eligible to participate. More than 61 000 consumers commented on approximately 800 establishments, either online, via eGuestSurv reviews, or by completing AA guest review forms. Congrats to all the winners! According to a tweet from the Mozambique News Agency (@MozNewsAgency), the Mozambican national carrier Linhas Aéreas de Moçambique, better known as LAM Mozambique Airlines, will increase its current two-weekly service between Maputo in Mozambique and Dar Es Salaam in Tanzania to a three-weekly service. The airline is operating an Embraer E-190 between the two destinations. As far as we know LAM has so far not announced when the increase will come into effect. update (06 Sept 2012): In the meantime, Emirates has confirmed that the planned re-commencement of A380 services between Dubai and Johannesburg has not been canceled, but postponed until April 2013. Emirates has cancelled the planned introduction of the Airbus A380 between Dubai and Johannesburg from 01 December 2012. Instead of servicing South Africa with the world's largest passenger airliner, the airline will replace its Boeing 777-300ER on the Dubai <> Singapore route with the Airbus A380. Consequently, the Dubai <> Johannesburg service will remain unchanged. update (10 Sept 2012): The Wittebome Civic Centre will become to Wynberg Civic Centre and Athlone Civic Centre will be named Dulcie September Civic Centre. Cape Town's naming committee also agreed not to rename Andries Pretorius Street in Somerset West, First Road, Jakkalsvlei Road, Nico Malan Street, Port Road, Selwyn Road, Tulbagh Road and Vanguard Drive. update: According to a tweet from @ewnreporter (Eyewitness News), the City of Cape Town says it hopes to have the six streets renamed by August 2013. Cape Town's naming committee just announced that some of the city's major roads will be renamed after South Africa's most-celebrated liberation heroes, and that other roads and city-owned buildings will be named after national and Cape Town-born anti-apartheid activists. The naming committee agreed not to rename DF Malan, Jan Smuts, Long Street, Jip de Jager and Willie van Schoor Drive. the square at the intersection of Castle Street and St Georges Mall got named after the late Khoisan descendant, Krotoa van Meerhoff. About a year ago, on 18 August 2011, the presidents of the Republics of Angola, Botswana, Namibia, Zambia and Zimbabwe signed a treaty that formally and legally established the Kavango–Zambezi Transfrontier Conservation Area (KAZA TFCA), the world's largest transfrontier conservation area. Seven month later, in March 2012, the Kavango Zambezi Transfrontier Conservation Area was officially launched. The multinational conservation area is spanning over 444,000 km² comprising multiple resource use areas such as National Parks, Game Reserves, Forest Reserves, Conservancies, Game/Wildlife Management Areas and Communal lands. The KAZA TFCA includes a major part of the Upper Zambezi basin, the Okavango basin, the Caprivi Strip in Namibia, the southeastern corner of Angola, southwestern Zambia and the northern wildlands of Botswana and western Zimbabwe. The Victoria Falls, located right on the border between Zambia and Zimbabwe, as well as the Hwange National Park in Zimbabwe, the Chobe National Park and the Okavango Delta in Botswana are also incorporated into Kavango–Zambezi Transfrontier Conservation Area. The KAZA TFCA initiative was created in cooperation with the Peace Parks Foundation and the World Wide Fund for Nature (WWF). The Narok District, located in Kenya's Rift Valley Province, is currently designated as one of the human-wildlife conflict hotspots in the country with elephants identified as the most problematic wildlife species. The Kenya Wildlife Service (KWS) is therefore currently translocating about 150 elephants in a month long exercise from the Narok North District to the Maasai Mara National Reserve. This is already the second phase of the translocation process. In the first phase carried out late last year, a total of 62 elephants were successfully moved from Narok North District to the Maasai Mara.The translocation is set to greatly minimize the human-elephant conflict particularly regarding to crop raids, property destruction, human injuries and death. A number of the translocated elephants will be fitted with GSM/GPS collar chips to monitor and track their movements. Due to its current financial situation, South Africa's low cost carrier 1time will suspend operations between Johannesburg's OR Tambo International Airport and Mombasa in Kenya from 17 September 2012. The beleaguered airline launched the twice-weekly service between the two destinations only on 05 March 2012. If you are booked on a flight with 1time between Johannesburg <> Mombasa, it is advised to get hold of the airline as soon as possible. 1time applied for "Business Rescue", which is similar to the process of "Chapter 11" in the USA, on 21 August 2012. "Business Rescue" aims at assisting with the rehabilitation of a company in financial distress. It provides temporary moratorium from creditors under legal supervision in clearly defined terms. 1time hopes to be back on track within the next three month. Slow motion great white shark attack video footage in high definition... simply stunning! Kudos @ ITM Instruments for sharing the footage! The world's first dedicated, non-commercial centre to care for baby rhinos has officially opened at the Entabeni Game Reserve in the Waterberg in the Limpopo Province in South Africa. The orphanage, which exact location is secret due to security reasons and which will therefore not be open to the public, has facilities to house up to 35 baby rhinos. The Entabeni Game Reserve, owned and operated by Legend Lodges, is covering an area of 220 km² and is home to lions, elephants, giraffes, leopards, warthogs, hippos and other safari animals in a variety of habitats. On 02 September 2012, Namibia will switch to daylight saving time and is therefore changing from UTC+1 to UTC+2. The time will change at 02:00am (forward clocks from 01:00am to 02:00am) with the exception of the Caprivi strip, as this area is not subject to the periodical time changes. Clocks in Namibia will get adjusted backwards to standard time again on 07 April 2012. Mororcco and Namibia are currently the only African countries using daylight saving time. Botswana: The Mashatu Hide - a wildlife photographer's dream coming true! The underground elephant hide in the Mashatu Game Reserve, located in the Northern Tuli Game Reserve of Botswana bordering South Africa, is a wildlife photographer's dream coming true. At a waterhole, the whole hide has been sunk into the ground right next to a waterhole that is in a prime elephant habitat. But it is not only elephants that are coming through to drink and bath at the waterhole, there are also kudu, impala, steenbok, mongooses and even baboons. Kudos at united film works for the amazing footage and thx for sharing it with us! The Northern Tuli Game Reserve is a game reserve spanning some 72 000 hectares of privately-owned land in the north-eastern sector of Botswana’s Tuli Block. It is bordered by South Africa to the south and Zimbabwe to the east. The area is home to a diverse range of wildlife, renowned for its Tuli elephants - the largest elephant population on private land in Africa, as well as to over 350 bird species recorded. According to the latest statistics released by South African National Parks (SANParks), South Africa has lost 339 rhinos to illegal poaching since the beginning of 2012. Kruger National Park remains the hardest hit by poachers, having lost 201 rhinos since the beginning of this year. Limpopo has lost 43 rhinos to illegal poaching; the North West province has lost 37 and KwaZulu-Natal 34 rhinos. 192 individuals have so far been arrested in 2012 in connection with rhino poaching. update (11 Oct 2012): From 01 December 2012, Ethiopian Airlines will continue to route its Addis Ababa <> Stockholm service via Cairo in Egypt on bord a Boing 737-800 aircraft. The service will also raise from currently 5 weekly flights to daily. update (30 Aug 2012): Ethiopian Airlines is extending the current Stockholm service adjustment until 30 November 2012. Semi-good news for all Swedes and Scandinavians flying with Ethiopian Airlines to Africa. The airline is currently re-routing its Addis Ababa (ADD) <> Stockholm (ARN) service via Cairo (CAI) in Egypt. The route change has been in vigour since 20 August 2012 and will last until 10 or 11 September 2012. On 27 August 2012, Ethiopian Airlines will re-route the service via Brussels (BRU) in Belgium, instead of Cairo (Egypt). According to Namibia's Ministry of Environment and Tourism (MET), the country has the world's highest population of cheetahs. Of the approx. 12,400 cheetahs remaining worldwide, 2,500 - 3,000 cheetahs can be found in Namibia. About 90% of country's cheetahs are living outside of protected reserves, primarily on commercial livestock farmlands. Their usual habitat in Namibia are grasslands, savannahs, areas of dense vegetation and mountainous terrain. The cheetah is the world's fastest land mammal, reaching speeds of up to 110km/hour. The most specialised of all the 36 species of cats is currently inhabiting 25 countries in Africa as well as parts of the Middle East. Cheetahs are included on the International Union for Conservation of Nature (IUCN) list of vulnerable species. The Sperrgebiet National Park is one of Namibia’s newest National Parks. 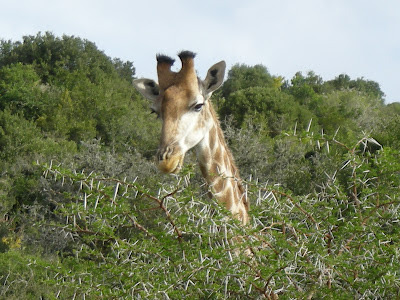 The Park, located in south-western Namibia, covers an area of 26,000 km² and forms a part of the Succulent Karoo biome that extends down into South Africa. Members of the public used to be banned from entering most of the Sperrgebiet (meaning "forbidden territory"), but since the area was turned from an exclusive diamond mining area into a National Park in 2008, the Ministry of Environment and Tourism (MET) is planning to open the Park to visitors travelling with special concessionaires. Dr. Christian Goltz, a photographer from Windhoek, was commissioned by the Namibian Government to create visual and textual information materials for the new Sperrgebiet National Park. He recently finished his work and allowed us to share the 13 information panels (zip-file, 18,730 KB) he created. 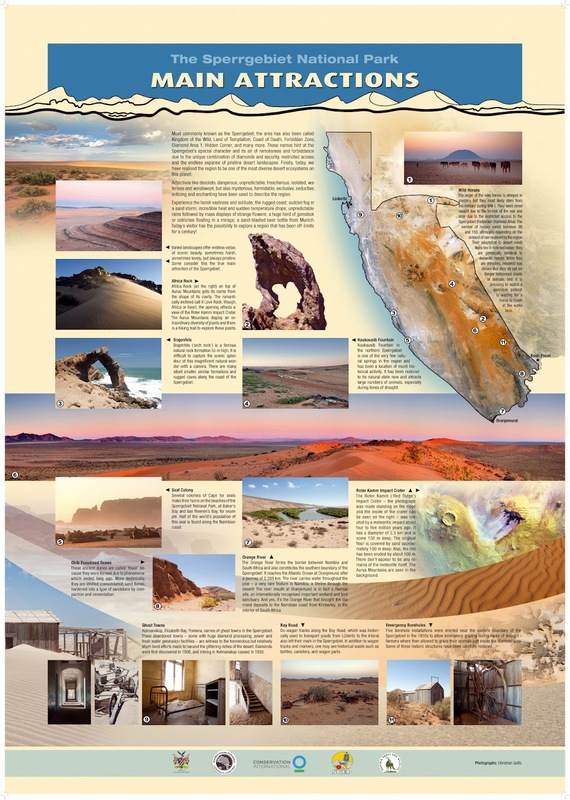 The panels will also be on display in an information centre at Kolmanskop and at other entrance points to the park once it is open to the public. 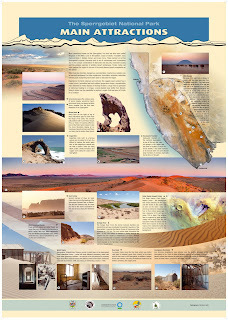 The Sperrgebiet National Park is located off the B4, the main tarred road running between Keetmanshoop and Lüderitz. As mentioned above, tours into the Sperrgebiet National Park are currently not available, but the Ministry of Environment and Tourism is definitely planning to open the park to visitors. I reckon the best thing to do when in the area is to contact one of the MET offices in Lüderitz, Rosh Pinah or Oranjemund and to ask them if & when tours will be made available. The first Rocking for Rhinos festival will be held on the weekend of World Rhino Day (and Heritage Day) from 22 - 23 Sept 2012 in Franklyn Park, a farm located just out of Hoedspruit in Limpopo, South Africa. The headliners of the festival will be a fusion of South African bands, performers, artists, conservationists and more. Allowances for camping have been created (camp ground will be open 21 - 24 Sept 2012), allowing festival goers to stay on the property during the event. If you don't want to camp, there are also accommodation options in Hoedspruit and surroundings. Crafts and numerous other stalls (food & drink included) will all be situated on the festival grounds too. Ticket options are ranging from standard full weekend and standard daily to VIP full festival tickets and can be obtained via the festival's website. All profits raised during the Rocking for Rhinos festival are going towards local anti-poaching teams Quemic, Pro Track and Plaaswag that are all active in the Kruger National Park area around Hoedspruit. For more info about the Rocking for Rhinos festival check their website, their facebook page and follow the festival on twitter! Kenya's flag carrier, Kenya Airways, has revised its Winter 2013/14 schedule for the Nairobi (NBO) <> New Delhi (DEL) route. The airline is not increasing the number of flights, as previously planned, to four weekly flights and will instead remain at three weekly flights between the two destinations. Kenya Airways launched nonstop flights to the Indian capital New Delhi, the airlines second destination in India after Mumbai, on 15 May 2012. Kenya Airways is operating a Boeing 767-300 on the route. Tanzania's largest airline, Precision Air, has announced that it will cancel its four fligths per week between Dar Es Salaam and Johannesburg (via Zanzibar) on 17 September 2012. According to the airline, the decision to discontinue operating the service was made in order to enhance Precision Air's domestic operations in Tanzania. The airline will make arrangements for customers who purchased tickets to fly after 17 September 2012 to reach their final destinations through other airline partners. update (03 Sept 2012): Save the Date: 6 September, 2012 | Time: From 09h00 -- last tour leaves at 16h00 | Venue: Durban Harbour, Marine Terminal Street. N-Shed Passenger Ocean Terminal. The Rainbow Warrior III, the new (christened in Oct 2011) purpose-built motor-assisted sailing yacht owned and operated by Greenpeace, is currently sailing in South African waters en route from Cape Town to Durban. Once the ship is in Durban, one will have the opportunity to come aboard to find out why the Rainbow Warrior III is a shining example of green ship engineering and to learn about her use in Greenpeace's work to protect the planet. All tours onboard the ship will be completely free. Although Greenpeace is currently unable to confirm an exact date for when the ship will dock in Durban, it is most likely to be in the first week of September 2012. Tanzania National Parks (Tanapa), the public organisation with the mandate of managing all areas designated as National Parks in Tanzania, has revised tariffs across fifteen Tanzanian National Parks, such as Serengeti National Park and Tarangire National Park. Tanapa also renamed the park entry fee to "conservation fee". The new tariffs will be effective as of 01 July 2013. According to a statement by the management of Tanzania National Parks, the changes to the currently existing tariffs needed to be done in order to meet the general increase in price levels of most commodities and services, as well as to improve the infrastructure such as roads, bridges and airstrips, to cater for the increased number of visitors and to diversify tourism facilities. Sabi Sand Reserve: Cheetah Plains Lodge reopened! The Cheetah Plains Private Game Reserve, a traditional style safari lodge situated in the north of the Sabi Sand Private Game Reserve, has reopened after undergoing renovations. The refurbishment included rebuilding the outside decks as well as paving the outside areas. Each chalet was repainted and refurnished. The Cheetah Plains Lodge has six standard rooms, which are comfortable and homely and equipped with an en suite bathroom, including a shower. The two luxury rooms are a bit bigger and both have an en suite bathroom as well as an outdoor shower is the perfect place to start your morning. The Sabi Sand Private Game Reserve is a private game reserve covering an area of 60,000-65,000 ha. Situated near to the Kruger Gate, Sabi Sand shares a common 50 km unfenced boundary with the Kruger National Park to the east. Air Austral, a French airline based at Roland Garros Airport in Sainte-Marie on Réunion, has rescheduled its flights between OR Tambo International Airport in Johannesburg and s from 29 Oct 2012, allowing easier connections for passengers originating in Cape Town and Durban. The new schedule will operate on Mondays and Thursdays. Travel video: "The back roads of the Wild Coast"